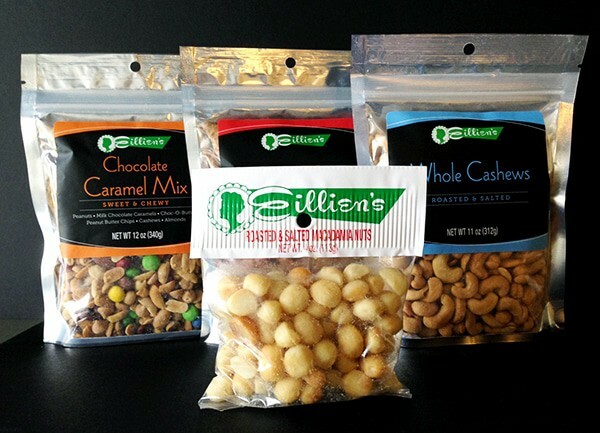 Anyone who bakes or eats nuts has most likely come across Eillien’s at some time or other. The product has been notable by a rather spare approach to packaging – typically a hanging clear plastic bag with an iconic white and green paper cap dominated by the Eillien’s brand. No confusion – you always knew what you were picking up, making product selection simple. The problem was that with time and normal wear the plastic bags would begin to crumple and cloud, potentially implying that the product was old or less than top of the line. 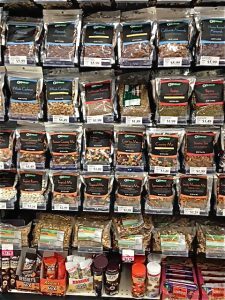 You can imagine my delight on discovering new packaging not only for Eillien’s nuts but also for what is now the brand’s larger array of integrated nut and snack products. The bags are designed to present a clear poly front to the consumer, reminiscent of the previous packaging, where product content is clearly displayed. 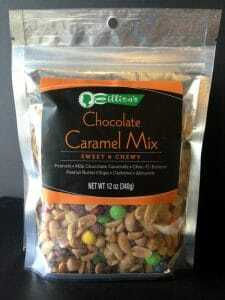 At the same time, the package structure has been updated to a resealable zipper stand up pouch. As a consumer this is such an intuitive change – finally, you can use just a portion of the product and reseal the bag, saving the rest for later. What I also found appealing about the packaging was the thought given to the retail display environment. Here was a full product line, arranged in an organized system. Although the package is designed so it can be hung up, it is presented in a coordinated rack system that sets the package upright as it faces the consumer, using gravity to shift the packages down into the display. It isn’t very complex but it creates the highest potential for packaging to be upright and in a proper display position. Each package is tightly filled with product, making it more likely to remain in a stable shelf position. Using a footed, resealable pouch is nothing new in itself but the graphic design system Eillien’s developed echoes the same direct, front and center communication style the structure provides. Using a label size common to most packages with an overall solid black color field, color blocking helps to segment and differentiate product styles and flavors. The label design consists of only those key elements necessary to make an informed purchase decision – product type, the flavor style or variation and the net content capped by the Eillien’s logo. I found only one element of the new package that could have been improved to make the graphic design system more effective. On the new package, the brand size and color were overwhelmed by the intensity of the black label; in other words, the branding became recessive, especially in contrast to the previous package where the brand was the single most important communication. I felt this package design revolution would also have presented an opportunity to step up the brand in keeping with the clean contemporary approach of the new package. This packaging redesign is a refreshing example of what flexible packaging can and should do. 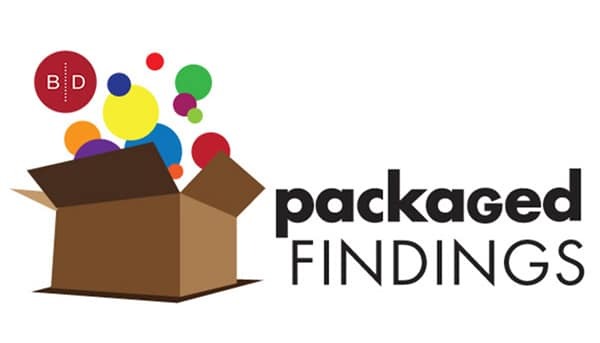 Making the investment to move to a new package structure and giving thought to package functionality and how it will work in the real world shelf environment, delivers increased potential for positive interaction and communication with the consumer. Best of all, by moving to this packaging format the brand remains front and center in consumers minds every time they go to the cupboard. Well done Eileen’s – you have made quite a statement with your new packaging system!